Fez is the refinement on a daily basis: the pleasure of the house, the subtlety of the cuisine, the elegance of the clothes, the harmony of the colors, the beauty rituals, the delicacy of the perfumes, the charm of the music. The most exquisite way to enjoy the art of living is to stay in the heart of the medina in one of the riads. Combining modern comfort, authenticity of the setting (architecture, patio, garden …) and a warm welcome, these mansions immerse you in the purest Fassie tradition. The city of Fes offers quality hotel facilities including the famous palace “Palais Jamaï”. Heir to the thirteenth-century Arab-Andalusian cuisine, Fès gastronomy combines sweet and savory, using fruits as vegetables and cleverly using all kinds of spices and condiments: cumin, coriander, pepper, sweet pepper, cinnamon … Ingredients found in pigeon and almond pastilla, a local recipe. The aerial puff pastry enveloping the stuffing requires a knack for women to be passed on from generation to generation. 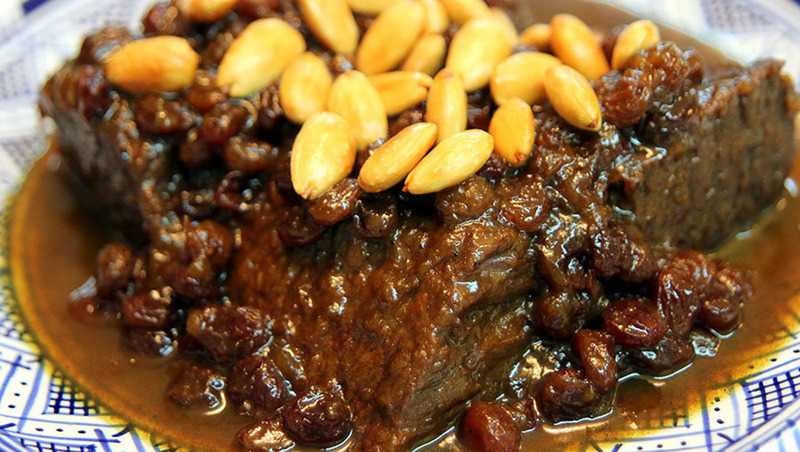 Mrouzia is the success of Fassie gastronomy; this dish, originally prepared at the Eid-el-Adha festival (the “Sheep Festival”), uses an original blend of spices, the Ras el hanout, or literally “head of the shop”, which includes 35 and 45 different spices from Morocco but also from the East or sub-Saharan Africa.